ICU-acquired weakness (ICU-AW) represents a severe and frequent complication of critical illness. It is believed that ICU-AW can affect more than half of all ICU patients. 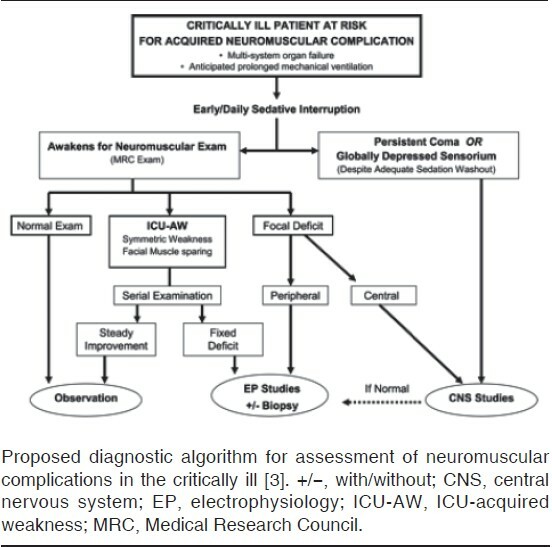 This major neuromuscular complication of critical illness is associated with increased rates of morbidity and mortality, markedly affecting both short-term and long-term clinical outcomes in critically ill patients. This article aimed to review all available data about this common problem. Background Open lung concept ventilation (OLCV) is a method of ventilation intended to maintain end-expiratory lung volume by increased airway pressure. 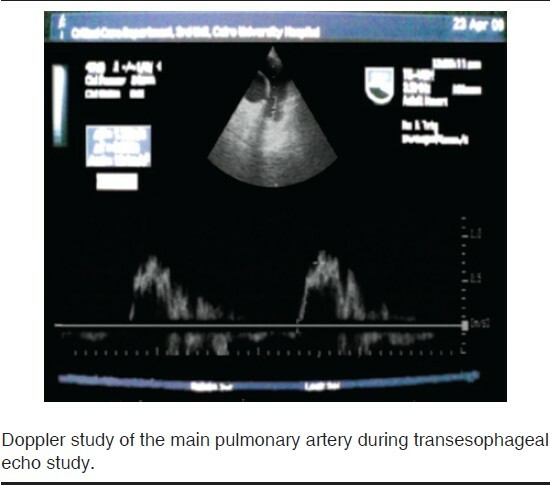 As this could increase right ventricular (RV) afterload, we investigated the effect of this method on RV outflow impedance during inspiration and expiration using transesophageal echo-Doppler in a trial to differentiate the RV consequence of increasing lung volume from those secondary to increasing airway pressure during mechanical ventilation. Patients and methods Forty stable patients on mechanical ventilation because of different causes (bronchopneumonia, cerebral infarction, hypertensive intracranial hemorrhage, noncardiogenic pulmonary edema postoperative, and post-traumatic mechanically ventilated patients) were enrolled prospectively in a cross-sectional clinical study. Each patient was first subjected to conventional ventilation (CV) with volume-controlled ventilation, followed by OLCV by switching to pressure-controlled mode, and then the recruitment maneuver was applied until PaO 2 /FiO 2 was greater than 375 torr. Hemodynamic (mean arterial pressure, central venous pressure, and heart rate) and respiratory (total and intrinsic positive end-expiratory pressure, peak, plateau, mean airway pressure, and total and dynamic lung compliance) measurements were performed before, 20 min after a steady state of CV, and 20 min after a steady state of OLCV. Also, transesophageal echo-Doppler was performed at the end of inspiration and at the end of expiration to calculate the mean acceleration (AC mean ), as a marker of the RV outflow impedance, 20 min after a steady state of CV and 20 min after a steady state of OLCV. Results During inspiration, AC mean was significantly lower during CV compared with OLCV (P < 0.001). Inspiration did not cause a significant decrease in AC mean compared with expiration during OLCV, but did do so during CV (P < 0.001). In comparison with baseline and CV, OLCV was associated with a statistically significant higher central venous pressure (P < 0.001 for both), higher total quasistatic lung compliance (P < 0.001 for both), and dynamic lung compliance (P = 0.001 for both). Moreover, the PaO 2 /FiO 2 ratio of OLCV was significantly higher than that at baseline and CV (P < 0.001 for both). Conclusion OLCV provides a more stable hemodynamic condition and better oxygenation and lung dynamics. Moreover, OLCV does not alter RV afterload during inspiration and expiration as RV afterload appears to be primarily mediated through the tidal volume. Background Elevated intra-abdominal pressure is frequently found among different populations of critically ill patients and may contribute to both morbidity and mortality. Various risk factors such as abdominal surgery, massive fluid resuscitation, and ileus have been proposed to contribute to the development of intra-abdominal hypertension/abdominal compartmental syndrome. This study was conducted to evaluate the incidence and prognostic significance of intra-abdominal hypertension in critically ill patients. Materials and methods Forty patients who met the inclusion criteria were included in this prospective cohort study. Patient characteristics were recorded on admission. Intra-abdominal pressure was measured using Foley bladder catheter by modified Kron technique described by Cheatham and Safcsak, The intra-abdominal pressure (IAP) was measured in supine and hemodynamically stable position every 6 hours for the first 24 hours and then twice daily, thereafter, the mean intra-abdominal pressures were defined as the mean of these daily measurements. Intra-abdominal hypertension was defined as an intra-abdominal pressure of over 12 mmHg, severe elevation as an intra-abdominal pressure of over 15 mmHg, and abdominal compartmental syndrome as a pressure of over 20 mmHg with evidence of at least one organ failure. Results In the study group, 47% were admitted for medical causes. Age (P < 0.0001), Acute Physiology and Chronic Health Evaluation (APACHE) score (P < 0.0001), and Sequential Organ Failure Assessment (SOFA) score (P < 0.0001) were highly significant with regard to the outcome. Nine patients (22.5%) did not survive; the mean age (61 ± 8 vs. 44 ± 12 years), APACHEII score (30 vs. 22), and SOFA score (6 vs. 4) were higher in the non- survivors group, significantly affecting the outcome. The mean intra-abdominal pressure during the 25 days of intensive care unit (ICU) stay was higher in the non-survivors group (17 ± 2). In addition, the occurrence of intra-abdominal hypertension was higher in the non-survivors group. The mean intra-abdominal pressure during the 25 days of intensive care unit (ICU) stay was higher in the nonsurvival group (17 ± 2). 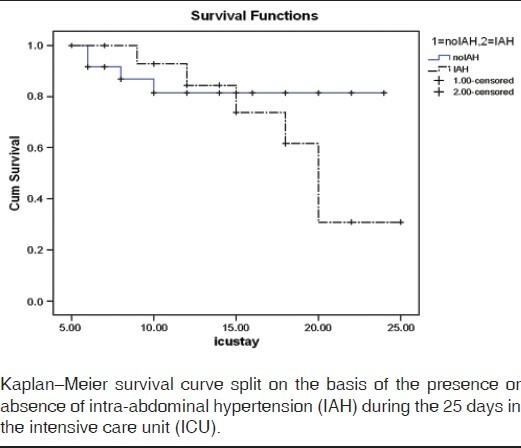 In addition, the occurrence of intra-abdominal hypertension was higher in the nonsurvival group. On admission, the mean age (P = 0.006), APACHE II score (P = 0.001), SOFA score (P < 0.001), and mean intra-abdominal pressure greater than 12 (P = 0.001), as well as the occurrence of intra-abdominal hypertension during ICU stay (P = 0.008), were independent predictors of mortality. The nonsurviving patients had a significantly higher SOFA score on admission and a significantly higher SOFA score during ICU stay. Conclusion The incidence of intra-abdominal pressure greater than 12 mmHg was high in critically ill patients, and its presence on admission or the occurrence of intra-abdominal hypertension is a prognostic factor for mortality during the ICU stay. Introduction Peripartum cardiomyopathy (PPCM) is a rare disorder of dilated cardiomyopathy in which no other cause of heart dysfunction can be identified within the final trimester of pregnancy or within 5 months after delivery. The aim of this prospective study was to assess the effect of 24-h infusion of levosimendan compared with milrinone on cardiac function and patient outcome. Patients and methods All patients enrolled in the study fulfilled the diagnostic criteria of PPCM. Patients were allocated randomly into one of two groups (15 patients each): group A received levosimendan infusion (a loading dose of 12 μg/kg intravenously for 10 min, followed by an intravenous infusion 0.1-0.2 μg/kg/min) and group B received milrinone infusion (a loading dose of 50 μg/kg administered intravenously for 10 min, followed by an intravenous infusion at a dosage titrated between 0.375 and 0.750 μg/kg/min) for 24 h after delivery. Hemodynamic and cardiac function parameters [stroke volume (SV), cardiac output (CO), and systemic vascular resistance] were monitored every 6 h for 24 h; also, cardiac biomarkers were monitored every 2 days thereafter until the day of discharge. Results No significant difference was found in hemodynamic parameters between group A and group B. Milrinone-treated patients showed a significant increase in CO parameters (SV and cardiac index) compared with the levosimendan group; yet, no significant difference was found in systemic vascular resistance between the two study groups. Also, no significant differences were found in cardiac biomarkers or outcome prognosis parameters between milrinone and levosimendan groups. Conclusion PPCM is an uncommon, but life-threatening condition. Despite the significant improvement in CO parameters (SV and cardiac index) in milrinone-treated patients, there was no significant difference in hemodynamic parameters, cardiac biomarkers levels, and outcome prognosis compared with levosimendan infusion. This study paves the way for further researches to establish an optimized protocol for the management of such a challenging condition. Purpose Avoidance of further worsening of hypoxemia is a prime objective during intubation of patients with acute respiratory failure. The aim of this study was to compare conventional laryngoscopy with intubating laryngeal mask airway (ILMA) with the aid of flexible fiberoptic bronchoscopes (FOBs) for intubation of class III/IV Coramck-Leahne patients in the intensive care unit. Materials and methods After failure of an initial attempt at intubation using conventional direct laryngoscopy, 112 Cormack-Lehane class III/IV patients were subjected to repeated attempts of intubation using either a Macintosh-type laryngoscope (ML, n = 59) or an ILMA with FOB (n = 53). After failure of two further trials using either technique, intubation would be attempted using the GlideScope video laryngoscope. The primary outcome was the incidence of severe hypoxemia (defined as arterial saturation <80%). Secondary outcomes were intubating time, number of attempts, and incidence of other complications. Results Twenty-five patients (42.2%) in the ML group suffered from severe hypoxemia, compared with eight (15.1%) patients in ILMA group (P = 0.002). The median (interquartile range) intubating time was 39 s (32.3-87.8 s) in the ML group versus 102 s (73.8-123 s) in the ILMA group (P < 0.001). Multiple logistic regression showed that the intubating technique was the only intubation-related predictor of severe hypoxemia (odds ratio, 4.08; 95% confidence interval, 1.63-10.18; P = 0.003). Both groups were comparable as regards the incidence of other intubation-related complications and postintubation course in the intensive care unit (P > 0.05). Conclusion In Cormack-Lehane class III/IV patients who failed to be intubated in the first attempt, retrying intubation using the ILMA with the aid of a flexible FOB was associated with a lower incidence of severe hypoxemia. Objectives Acute postoperative pain following radical mastectomy has been shown to increase the risk for chronic postmastectomy pain, a type of neuropathic pain. Preemptive analgesia has been shown to be effective in reducing the incidence of some types of neuropathic pain. We investigated the analgesic efficacy of duloxetine on acute and chronic pain in patients undergoing breast surgery. Materials and methods Fifty patients scheduled for radical mastectomy with axillary dissection were randomized in a double-blinded manner to receive either duloxetine 60 mg (group D) starting 2 days before operation for 2 weeks followed by 30 mg until the end of study or placebo capsules (group P) for the same course. Total morphine consumption over the first 48 h, time to first rescue analgesic, and pain scores were recorded [visual analog scale (VAS)] at 2, 4, 12, and 24 h postoperatively, daily until the fourth day, then 3 and 6 months later. Results In the duloxetine group compared with the placebo group, total morphine consumption was less (at 24 h, 14 ± 2.3 vs. 24 ± 1.7 and at 48 h, 11.5 ± 2.5 vs. 20 ± 1.4, P < 0.001, respectively), time to first rescue analgesic was longer (4.6 ± 0.7 h vs. 2.5 ± 0.5 h, P < 0.001, respectively), with significant decrease in VAS scores of pain at all time points (P < 0.001), and the incidence of pain was less at 3- and 6-month follow-up. Conclusion Duloxetine significantly reduced postoperative analgesic requirements, VAS, and incidence of chronic pain at 3- and 6-month follow-up in women undergoing breast surgery. Objective The aim of the present study was to design a trial to improve the control of bleeding during spine surgery by controlled hypotension achieved through maintenance of anesthesia using remifentanil with either propofol infusion or isoflurane inhalation. Patients and methods The study included 40 patients assigned for lumbar spine fixation surgery (two levels). Patients were randomly allocated into two equal groups to receive either remifentanil infusion and total intravenous anesthesia with propofol (group I) or remifentanil infusion with isoflurane inhalation anesthesia (group II). The infusion rate of propofol and MAC of isoflurane were adapted to maintain mean arterial pressure in a range of 60-70 mmHg and the heart rate at about 70 beats/min. We compared the amount of intraoperative blood loss, the need for blood transfusion, duration of operation, and surgeon's satisfaction of a bloodless field between both groups. Results There was no statistically significant difference between both groups in operation time (P = 0.2). The amount of intraoperative blood loss in group I was significantly lower compared with group II (P = 0.002). The total bleeding score in group I was significantly lower compared with group II (P = 0.018). Eleven patients required blood transfusion with significantly higher frequency of blood transfusion in group II [nine patients (45%)] than [two patients (10%)] in group I (P = 0.033). Mean total surgeon satisfaction score in group I was significantly higher compared with group II (P = 0.014). Conclusion Propofol/remifentanil intravenous anesthesia for spinal fixation surgery is beneficial, allowing properly controlled hypotension, minimized intraoperative bleeding, decreased need for blood transfusion, and improved surgical field visibility, compared with isoflurane/remifentanil anesthesia. We evaluated the optimal dose of preemptive gabapentin for postoperative pain relief after debridement of burned patient and its effect on morphine consumption during the initial 24 h after surgery. Patients were divided into seven groups to receive gabapentin 300, 600, 900, 1200, 1500, 1800, and 2100 mg 1 h before surgery. After surgery, patients were transferred to the postanesthesia care unit. 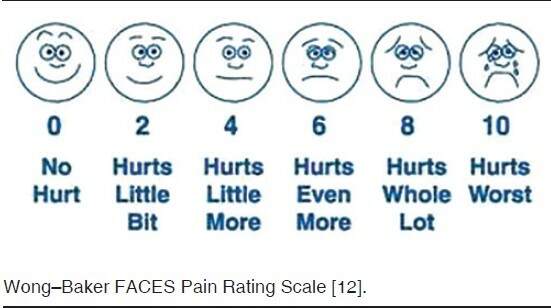 Pain scores were recorded at time points of 2, 6, 12, 18, and 24 h in postanesthesia care unit on a visual analog scale (VAS: 0-10 cm). Patients received patient-controlled analgesia (morphine), and total morphine consumption during the initial 24 h was recorded. Data were entered into statistical software package SPSS 9.0 for analysis. Patients who received gabapentin 600, 900, 1200, 1500, and 1800 mg had lower VAS scores at all time points than patients who received gabapentin 300 mg. Increasing the dose of gabapentin from 1500 to 1800 mg did not decrease the VAS score nor it decreased morphine consumption. Thus, gabapentin 1500 mg is the optimal preemptive dose for postoperative pain relief following debridement of burn patients. Background Chronic post-thoracotomy pain, which is defined as pain that recurs or persists for more than 2 months, is a common problem affecting the quality of life of patients. We have evaluated the efficacy of perioperative pregabalin for reducing postoperative pain and the incidence of chronic post-thoracotomy pain. Patients and methods Sixty patients aged 30-49 years undergoing thoracotomy were allocated randomly to receive either pregabalin (75 mg oral twice daily for 5 days before and 5 days after the operation) or placebo at corresponding times in a double-blinded manner. Both groups received the same anesthetic technique. Our primary target was to measure the incidence of chronic postsurgical pain using the Leeds Assessment of Neuropathic Symptoms and Signs Pain Scale at 3- and 6-month intervals. Morphine consumption was measured as well as the length of hospital stay and the occurrence of postoperative systemic complications. 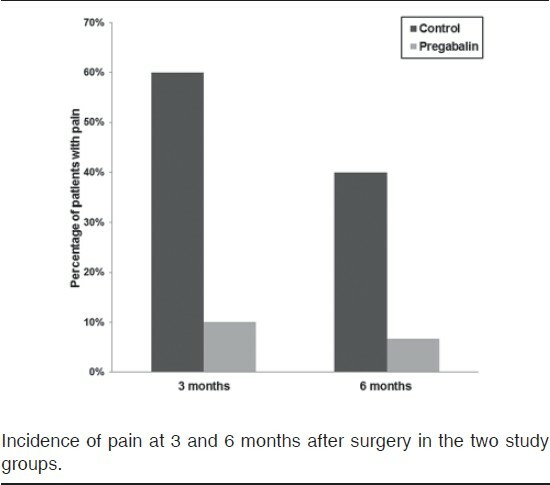 Results Pregabalin decreased the incidence of chronic postoperative pain at 3 and 6 months from 60 and 40% to 10 and 6.7%, respectively. Also, pregabalin decreased the postoperative acute pain intensity as indicated by lower morphine consumption (P < 0.001). Pregabalin decreased postoperative hospital stay, with a time of discharge of 10 (9-10) days for the control group and 8 (7-8) days for the pregabalin group (P < 0.001). No statistical difference was found in the incidence of complications. Conclusion Perioperative pregabalin reduces the incidence of chronic post-thoracotomy pain, with less postoperative morphine consumption together with early hospital discharge. Background Laryngospasm is the most common cause of airway obstruction after tracheal extubation. Propofol is known to inhibit airway reflexes and is used in treating laryngospasm in subhypnotic doses. Diazepam also decreases airway reflexes and was used in treating hysterical stridor. In this study, we aimed to compare the effectiveness of both drugs in treating laryngospasm. Patients and methods This study was conducted over a period of 3 years. We enrolled 40 patients, 20 in each group, of American Society of Anesthesiologists (ASA) grades I and II, undergoing elective oropharyngeal surgeries. Patients who received drugs before extubation such as lidocaine or a supplemental dose of narcotics were excluded from the study; patients of ASA grade III/IV, those above 60 years or below 12 years, and those with a full stomach were also excluded. The anesthetic technique was the same in all patients. Anesthesia was induced using 4 mg/kg thiopental, 0.5 mg/kg atracurium, and 1 μg/kg fentanyl. A cuffed tracheal tube was inserted and the lungs were ventilated with oxygen and 1% isoflurane. At the end of the surgery, residual neuromuscular blockade was antagonized. The presence of laryngospasm after extubation was detected, and the patients were randomly allocated to either group P that received 0.5 mg/kg propofol intravenously or group M that received 0.03 mg/kg midazolam intravenously. In both groups 100% O 2 and manual ventilation was continued until the spasms were relieved and the saturation returned to normal. Response of patients to both drug therapies was recorded. The mean arterial pressure and heart rate were measured. Results In the propofol group, 15 of 20 patients responded well to the dose of propofol, whereas in the midazolam group, 17 of 20 patients responded to treatment. The other patients in the two groups, who were not relieved by either propofol or midazolam, were intubated after administration of succinylcholine. There was a significant decrease in the mean arterial pressure and heart rate in both groups after administration of the study drugs, and this decrease was comparable and similar in both groups. Conclusion In patients in whom the use of succinylcholine is contraindicated (as in those with burns or muscular dystrophy), propofol or midazolam can be an alternative option. Background Shivering is one of the common problems during spinal anesthesia and may lead to several complications, interfere with patient monitoring, and is bothersome for the mother while holding her newborn. We performed this prospective, double-blinded, placebo-controlled study to determine the ability of preoperative intravenous (IV) granisetron to prevent or decrease shivering after spinal anesthesia during elective cesarean delivery. 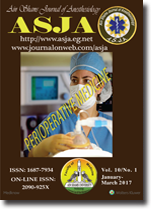 Materials and methods A total of 117 ASA I/II parturient women undergoing elective cesarean delivery were enrolled. Patients were randomly allocated into two groups: group G (n = 58) received 3 mg in 3 ml granisetron intravenously and group P (n = 59) received 3 ml intravenous normal saline before performing spinal anesthesia. Spinal anesthesia was performed in all patients using 10 mg heavy bupivacaine 0.5% and 15 μg fentanyl. Shivering was graded according to the Wrench score: 0 = no shivering; 1 = piloerection, peripheral vasoconstriction, or peripheral cyanosis without other cause; 2 = visible muscular activity confined to one muscle group; 3 = visible muscular activity in more than one muscle group; and 4 = gross muscular activity involving the entire body. Rescue medication intake, interference with neonatal holding, interference with monitoring, and maternal vomiting in 12 h postoperative as well as tympanic membrane temperature and Apgar score were recorded. 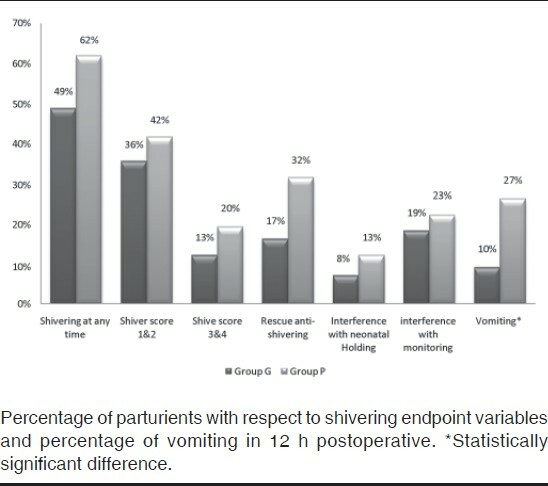 Results The percentage of shivering and shivering score value among parturients in both groups did not show significant statistical difference during the study time periods, with a P value greater than 0.05. With respect to rescue medication intake (P = 0.086) as well as interference with monitoring (P = 0.653) and neonatal holding (P = 0.653), there was no statistically significant difference as well. In addition, tympanic membrane temperature (P = 0.48) and 1-min Apgar score (P = 0.09) did not show statistically significant difference. Granisetron significantly reduced the incidence of nausea and vomiting during the 12-h postoperative period, with only six (10.3%) mothers in group G complaining of nausea and vomiting in comparison with 16 (27.1%) mothers in group P (P = 0.036). Conclusion Preoperative intravenous granisetron for shivering prophylaxis in cesarean section under spinal anesthesia did not significantly reduce the incidence or severity of shivering. Background Postanesthetic shivering (PAS) can influence hemodynamic stability and recovery from general anesthesia. We tested the efficacy of intramuscular dexmedetomidine in prevention of PAS in patients undergoing arthroscopic anterior cruciate ligament reconstruction. Materials and methods In this prospective, randomized, and double-blind controlled study, 85 ASA I male patients, aged 18-40 years, scheduled for arthroscopic anterior cruciate ligament reconstruction under general anesthesia were enrolled. Forty-five minutes before the expected end of surgery, the patients were randomized to receive an intramuscular injection in the deltoid muscle of either dexmedetomidine 2.5 μg/kg (group D, n = 43) or isotonic saline (group C, n = 42). Extubation time, the incidence and grades of shivering, pain intensity, degree of sedation, and side effects were recorded. Results The mean ± SD extubation time was prolonged in the dexmedetomidine group than in the control group (8.4 ± 2.3 vs. 7.2 ± 2.6 min, respectively; P = 0.0268). The incidence of shivering was 64.28% in the control group compared with 11.62% in the dexmedetomidine group (P ≤ 0.0001), with lower intensity in group D. Assessment of pain intensity until 2 h postoperatively revealed significantly lower scores in dexmedetomidine-treated patients (P = 0.0239 at the second hour). Sedation scores were higher in the dexmedetomidine group until 4 h postoperatively (P = 0.032 at the fourth hour). The mean heart rates and blood pressure were significantly lower in group D than in group C (P < 0.05) in most of the assessments until 6 h postoperatively. Conclusion Intramuscular dexmedetomidine provides effective prophylaxis against PAS without major side effects. Background We designed our study to compare the effects of dexmedetomidine infusion versus propofol infusion on perioperative hemodynamics, sedation, pain, and recovery scores for invasive procedures in pediatric oncology patients. Patients and methods Forty children, 6-12 years of age, ASA I or II with hematological cancer, were randomized to receive either dexmedetomidine or propofol infusion during anesthesia for diagnostic or prognostic short-duration procedures. All patients received ketamine 0.5 mg/kg intravenously before the start of the procedure. Increments of ketamine (0.33 mg/kg, intravenously) was given to maintain the sedation score 5-6 using the Ramsay score. Routine vital signs, oxygen saturation, time for induction of sedation, total incremental doses of ketamine, time for spontaneous eye opening after stopping the infusion, recovery excitation score, and pain score were recorded. Results Induction and recovery times were significantly shorter in the propofol/ketamine group. Although there was significant difference in heart rates between the two groups with lower rates for the dexmedetomidine/ketamine group, patients in the dexmedetomidine/ketamine group had significant lesser excitation score and lower pain score than patients in the propofol/ketamine group. 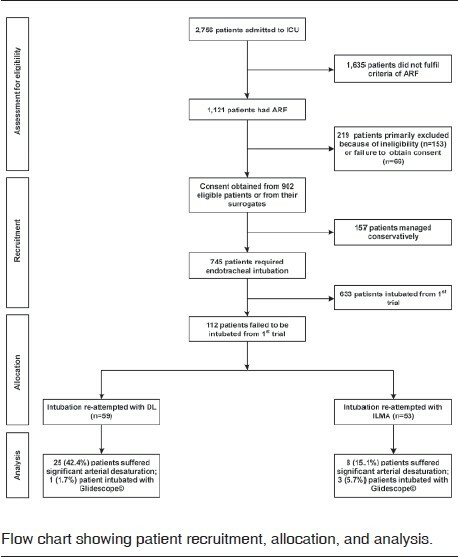 Conclusion Dexmedetomidine/ketamine infusion provides hemodynamic stability, lower recovery excitation, and pain scores, although recovery time is prolonged when compared with propofol/ketamine infusion in invasive procedures in pediatric oncology patients. Thus, it represents an alternative sedoanalgesic choice for this population. Background Increasing awareness of neurologic abnormalities associated with congenital heart surgical intervention has heightened investigations for prevention of neurologic injury during the perioperative period. This study investigated the effects of propofol and sevoflurane on cerebral oxygen supply demand balance using transcranial Doppler sonography and jugular bulb saturation in pediatric open heart surgery. Methods After obtaining institutional approval and a written consent from parents, 60 children who were admitted for elective open cardiac surgery for correction of congenital heart disease using CPB were included in this study. Children were randomized into two groups; group (P) and group (S). Induction of Anesthesia was achieved by 5 μg/Kg I.V. fentanyl, propofol 2- 2.5 mg/Kg (in propofol or P group) or sevoflurane 2-3 MAC (in sevoflurane or S group). Anesthesia was maintained by propofol infusion between 75-100 μg/kg/min in P group or sevoflurane 2 MAC in S group. Calculated parameters from the blood gas variables included cerebral metabolic rate of oxygen (CMRO 2 ), cerebral extraction of oxygen (CeO 2 ) and cerebral blood flow equivalent (CBF). Arterial blood gases (ABG) and velocities of flow were monitored by Trancranial Doppler at 5 time points : before the surgery, before CPB, during CPB (after establishment of full flow), after CPB and after recovery. Neurological examination and CT scan were done before surgery and 2 days after that. Results There is no significant difference between the two groups in demographic data. 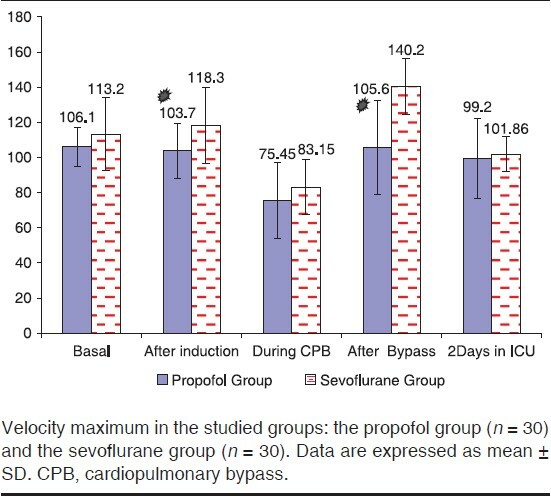 Children in propofol group showed lower heart rate values after induction and after CPB than those in sevoflurane group. Mean arterial pressure was statistically higher in sevoflurane group compared with propofol group after induction. Children in sevoflurane group showed significantly higher; velocity maximum, velocity mean and pulsatile index, in the after induction and after bypass periods than those in propofol group. Velocity minimum showed no difference between the two groups. SjvO 2 , CMRO 2 , CeO 2 and CBF was significantly different after induction in sevoflurane group compared with propofol group. Perioperative blood gases showed no difference between the studied groups. Conclusion Compared with propofol anesthesia, sevoflurane anesthesia provides a wider margin of safety against impaired cerebral oxygenation and better preservation of systemic hemodynamics. Moreover, cerebral oxygen saturation may not reflect changes in cerebral oxygenation as monitored by jugular venous oxygen tension measurement in children undergoing CPB. Background Caudal block is the most frequently used regional anesthetic technique for pediatric analgesia, with the disadvantage of limited duration of action. Transversus abdominis plane (TAP) block has been reported to provide effective analgesia after lower abdominal surgery, but there are few data comparing caudal block with ultrasound-guided TAP block in pediatric patients undergoing surgical pyeloplasty. 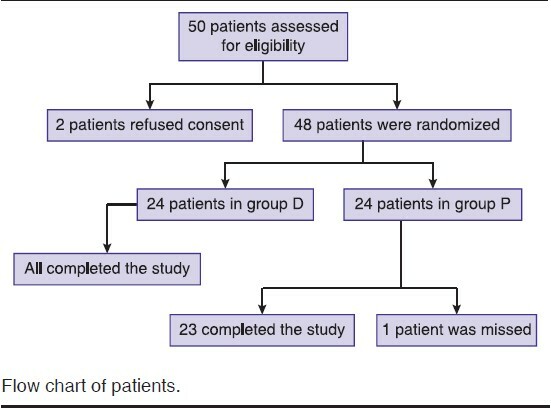 Patients and methods Thirty-nine patients (6 months to 6 years) scheduled for elective surgical pyeloplasty were divided into two groups in a double-blinded randomized manner. After sevoflurane in oxygen anesthesia, patients were assigned to one of the two groups: group A (caudal; n = 19 patients) received a single caudal dose of isobaric bupivacaine 0.25% (1.25 ml/kg) and group B (TAP block; n = 20 patients) received isobaric bupivacaine 0.25% (0.3 ml/kg). The primary outcomes were the time to first analgesia in minutes and the analgesic doses (oral acetaminophen and rectal diclofenac) required during the first 24 h postoperatively. The secondary outcome measures included FLACC pain scale score and intraoperative hemodynamic variables. Results Group B had a significantly longer time to first analgesia (602, 705, 748 vs. 250, 280, 365 min) and required significantly lower doses of acetaminophen (301.9 ± 161.26 vs. 635.05 ± 205.42) and rectal diclofenac (0, 0, 0 vs. 0, 0, 12.5 mg) than group A. FLACC pain scale score was significantly lower in group B than in group A (P < 0.05) at 2, 4, 6, 8, 10, 12, 16, 18, 20, and 24 h postoperatively. There was no significant difference between both groups with respect to intraoperative hemodynamic variables. Conclusion Unilateral TAP block provided superior analgesia compared with single caudal block injection in the first 24 postoperative hours after surgical pyeloplasty in infants and children aged 6 months to 6 years. Background Ultrasound-guided supraclavicular block (US-SCB) can be achieved by needle maneuvering through the plexus ensuring local anesthetic deposition. Local anesthetic deposition at the corner pocket through a single path provides competent anesthesia mainly for the lower brachial plexus trunks. Our study hypothesized that dual path provides better block quality than single-path technique. Patients and methods This was a prospective randomized blinded study performed on patients undergoing upper limb surgery under US-SCB; patients were randomly allocated into two groups: in group S 30 ml of levobupivacaine 0.5% was injected in the corner pocket and in group D 15 ml was injected in the corner pocket and 15 ml was deposited in the center of the plexus. Sensory and motor blockades were recorded every 5 min until 30 min. The primary outcome was the percentage of patients achieving sensory and motor block over time interval, and the secondary outcome was total procedure time, incidence of paresthesia, time to sensory and motor recovery, and patient satisfaction. 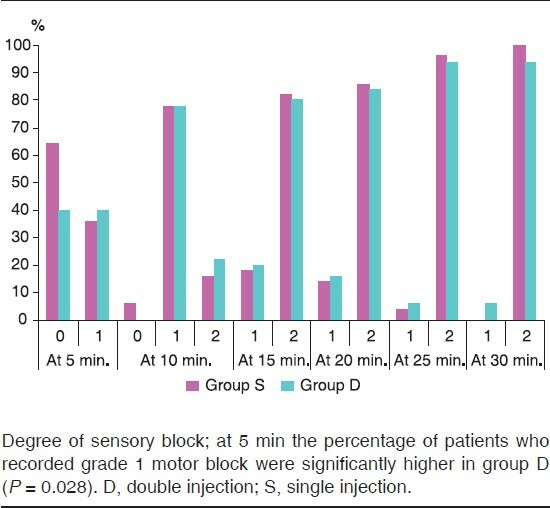 Results A total of 100 patients were equally allocated into two groups; early initial sensory block was achieved in 60% of patients (P = 0.028) and motor block in 86% of patients (P = 0.013) in the dual-injection group at 5 and 10 min, respectively. No significant difference was found in the percentage of patients progressed to sensory and motor blocks over time (P > 0.05). Paresthesia incidence in the dual group was 52% (P = 0.042), with no neurological adverse events. Significantly shorter total procedure time was observed in the single-injection group (P = 0.043). Conclusion Single US-SCB provides effective sensory and motor surgical block with less incidence of paresthesia and shorter performance time. Background When accidental dural puncture (ADP) occurs, options are either to cancel the technique and administer general anesthesia, perform spinal anesthesia, or reattempt epidural at a level above or below the site of dural puncture. The previous concept of avoiding the epidural technique at the same level as that of the ADP needs to be revised. Patients and methods The patients in this study were those scheduled for elective orthopedic procedures under epidural anesthesia, during which ADP occurred. Patients were divided randomly into three groups according to the level of epidural injection in relation to the site of ADP: group S included patients who received epidural anesthesia at the same site as that of the ADP. Groups A and B included patients administered epidural anesthesia at a level above or below the site of ADP, respectively. After identifying the epidural space, the test dose was administered. If spinal anesthesia was administered, the operation was started and epidural anesthesia was canceled. If no signs of intravenous injection or spinal anesthesia occurred, 20 ml bupivacaine 0.5% was injected into the epidural space. The primary outcome was the safety of epidural anesthesia at the same level as that of ADP. The secondary outcomes were simplicity and incidence of side effects. Results No cases of untoward subarachnoid injection were recorded. Identification of the epidural space was significantly easier and less time consuming in group S. No significant difference was observed between the groups studied in terms of side effects (nausea, vomiting, and headache). However, backache was significantly less in incidence and severity in group S. Conclusion Epidural anesthesia at the site of ADP was as safe as at a level above or below. Moreover, it was easier and less time consuming, with less incidence of backache. Background Postoperative pain after total knee arthroplasty is a major interest. Epidural analgesia is considered the preferable method of postoperative analgesia for total knee arthroplasty in many countries. Dexmedetomidine is an α-2 agonist, which has many beneficial effects when administered epidurally. Purpose The aim of the study was to provide effective postoperative analgesia with hemodynamic stability through reduction in the amount of local anesthetic administered epidurally using dexmedetomidine as an adjuvant to epidural bupivacaine. Patients and methods A total of 50 patients who were 40-60 years of age, had ASA physical status I-III, and who were undergoing elective total knee arthroplasty were randomly divided into two equal groups: group D received 2.5 ml of a mixture of bupivacaine 0.125% and dexmedetomidine 0.2 μg/kg/h and group B received only 0.125% bupivacaine 5 ml/h for postoperative analgesia. Postoperative pain was scored by visual analogue scale; sedation score and cardiorespiratory parameters were recorded every 6 h for 48 h postoperatively. Data were recorded and statistically analyzed. Results The demographic data were comparable in both groups. Visual analogue scale of pain showed a significant reduction between the two groups at both rest and movement, and the total dose of nalbuphine consumption during the study period was significantly reduced (P < 0.002) in group D (5 ± 5.15) than in group B (11 ± 7.63). Sedation scores were significantly higher in group D compared with group B. 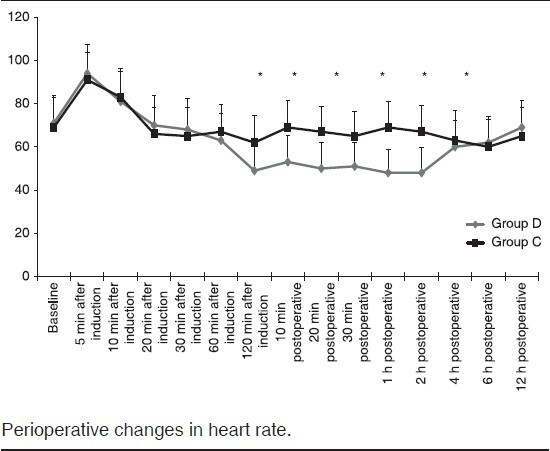 Heart rate was significantly reduced in group D from 18 h postoperative until the end of the study, and the mean arterial blood pressure was significantly reduced in group B than in group D throughout the study period. Conclusion Dexmedetomidine is an ideal adjuvant to epidural bupivacaine for postoperative analgesia in patients undergoing total knee arthroplasty. Background Regional anesthesia has been widely practiced with minimal risk of complications. The aim of this study was to compare the efficacy of nalbuphine and tramadol as separate adjuvants to lidocaine in intravenous regional anesthesia (IVRA) (Bier's block). Materials and methods This randomized double-blind controlled study was conducted in the Department of Anesthesia, Kasr Al Ainy Teaching Hospital, Cairo University, Egypt. Sixty patients, aged 20-60 years, ASA I-II, both sexes, scheduled for minor hand surgeries under IVRA were enrolled in the study. The patients were randomly allocated into three equal groups: group L (n = 20) received lidocaine in IVRA, group LT (n = 20) received lidocaine and tramadol mixture, and group LN (n = 20) received lidocaine and nalbuphine mixture. The onset, duration of both sensory and motor blocks, time to first analgesic request postoperatively, and complications related to the drugs or technique were recorded. Results There was a statistically significant acceleration in the mean onsets with significant prolongation of the mean duration of sensory and motor blocks in group LT and group LN compared with group L (P < 0.05). The results observed in both groups were comparable. In addition, there was an increase in the mean time to first analgesic request in group LT and group LN compared with group L (P < 0.001). Group LN had the longest duration time of postoperative analgesia and this was statistically significant compared with group LT (P < 0.001). Complications were minimal and nonsignificant. Conclusion The use of nalbuphine and tramadol as adjuvants to lidocaine in IVRA resulted in significant acceleration of the onset and prolongation of the duration of both sensory and motor blocks, with minimal insignificant complications. Both tramadol and nalbuphine effects were comparable. Background Ultrasound imaging of the spine has recently been proposed to facilitate identification of the anatomic landmarks for subarachnoid blockade. This study assessed the accuracy and precision of the ultrasound-guided subarachnoid blockade over the conventional surface landmark-guided technique in patients with difficult surface anatomic landmarks undergoing elective orthopedic lower limb surgery. Patients and methods This prospective, randomized controlled study was conducted on 60 patients with difficult surface anatomic landmarks for subarachnoid block, scheduled for elective orthopedic lower limb surgery. These patients were randomly allocated into two equal groups: group LM in which subarachnoid block was performed using the conventional surface landmark-guided technique and group US in which subarachnoid block was performed using the ultrasound. The primary outcome was the rate of successful dural puncture on the first needle insertion attempt. The secondary outcomes included number of needle redirection, number of repeated needle insertion, number of failed attempts, time taken to establish landmarks, and time taken to perform the spinal anesthesia. Results Successful dural puncture on the first needle insertion attempt was achieved in 21 (70%) patients in group US and in eight (26.7%) patients in group LM (P < 0.001), whereas the number of patients requiring needle redirection in group US was seven (23.3%), which was significantly less than in group LM in which half of the patients required needle redirection after the first insertion of the needle. The number of patients requiring repeated needle insertions in group LM was three-fold the number of patients in group US [six (20%) vs. two (6.7%), respectively]. There was only one failed attempt in group LM. The mean time taken to establish anatomic landmarks was highly significantly longer in group US than in group LM (5.7 ± 0.93 vs. 2.27 ± 1.23 min, respectively; P < 0.001). There was a highly significant reduction in the time required to perform the spinal anesthesia in group US (5.01 ± 0.78 min) than in group LM (7.75 ± 0.96 min; P < 0.001). Conclusion Ultrasound-guided approach is a reliable and effective method in patients in whom technical difficulty is expected. Background This randomized double-blind study was started with an objective of comparing two commonly used vasopressors (phenylephrine and ephedrine) as intravenous bolus injection to reduce hypotension in elective cesarean section in mothers with pre-eclampsia and estimating their impact on fetal outcome. Place of the study The study was conducted in Woman Health Hospital, Assiut University, Egypt. Patients and methods We studied 40 pre-eclamptic patients undergoing elective cesarean section under spinal anesthesia who developed hypotension after subarachnoid block. They were randomly allocated to one of the two groups to receive an intravenous bolus of the following drugs: group P, phenylephrine (75 μg, n = 20) or group E, ephedrine (6 mg, n = 20). Hypotension was defined as a decrease in systolic pressure to more than 25% of baseline values or systolic blood pressure of less than 90 mmHg. Results There were significant differences in systolic and diastolic blood pressure and pulse rate for the two studied drugs, which were less affected in the ephedrine group as compared with the phenylephrine group. Neonatal Apgar scores were within normal range in both groups. With respect to arterial and venous blood gases, there was significant difference in base excess and nonsignificant difference in pH and PO 2 between the two groups. Conclusion Both vasopressors phenylephrine (75 μg) and ephedrine (6 mg) were given as a bolus dose to pre-eclamptic candidates receiving spinal anesthesia, causing hemodynamic stability to mothers. However, the usage of phenylephrine was safer for fetal outcome than epinephrine in high-risk cesarean sections (pre-eclampsia) under spinal anesthesia. Purpose The aim of the study was to compare the efficacy of ephedrine versus hydroxyethyl starch (HES) 6% in prevention of hypotension during spinal anesthesia for cesarean delivery. Materials and Methods A total of 120 ASA physical status I and II parturients scheduled for cesarean delivery were assigned into four groups following induction of spinal anesthesia: group E - the ephedrine group (n = 30) received ephedrine 15 mg intravenous bolus immediately after spinal anesthesia was given and the patient returned to the supine position; group HES - the HES 6% group (n = 30) received 1000 ml of HES 6% just before spinal anesthesia was administered; group EHES - the ephedrine and HES 6% group (n = 30) received HES 6% 500 ml before administration of spinal anesthesia and ephedrine 15 mg intravenous bolus right after spinal anesthesia was given; and the last group was the control group, the LR group - lactated Ringer (n = 30), preloaded with lactated Ringer solution, 1000 ml infusion just before spinal anesthesia. The incidence of hypotension, reactive hypertension, nausea and vomiting, and Apgar scores at 1 and 5 min were noted. Results No significant demographic differences between groups were noted. The incidence of hypotension was significantly lowest in the group EHES and highest in the LR group (the control group). Moreover, the incidence of rescue ephedrine administration was lowest in the EHES group (3.3%) and highest in the LR group (55%). The incidence of nausea and vomiting was significantly lowest in the group EHES (3.3%) and highest in the group LR (53.3%). Conclusion HES 6% 500 ml before administration of spinal anesthesia and ephedrine 15 mg intravenous bolus right after spinal anesthesia is effective in preventing spinal-induced maternal hypotension during cesarean section. Objectives The aim of the study was to evaluate the efficacy of single-shot epidural injection of combined low-dose magnesium sulfate with levobupivacaine as a pre-emptive analgesic to decrease the postoperative analgesic requirement in female patients undergoing abdominal hysterectomy. Patients and Methods The study included 90 ASA I-II adult female patients assigned for open abdominal hysterectomy. Patients were randomly allocated into two equal groups: group L received single-shot epidural plain levobupivacaine 0.25% and group M received single-shot epidural levobupivacaine 0.25% mixed with 50 mg MgSO 4 . 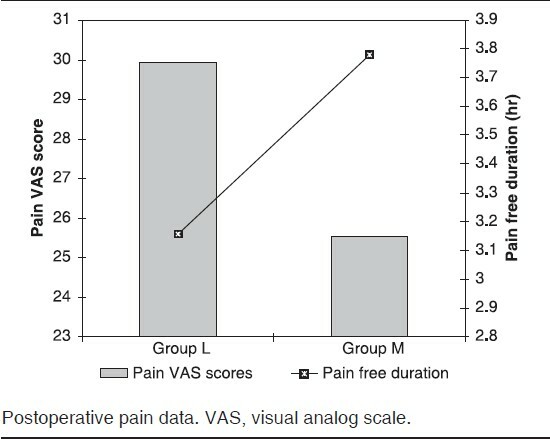 The intensity of postoperative pain was measured with 0-100 point visual analog scale (VAS). Rescue analgesia was given if patients had VAS scores of 40 or more and the duration of analgesia was determined. The degree of sedation was assessed 30 and 120 min after admission to the recovery room using the four-point Brussels Sedation Scale. Results Cumulative pain VAS until the end of first postoperative 24 h was significantly lower in patients who received combined epidural therapy compared with those who received local anesthetic alone. 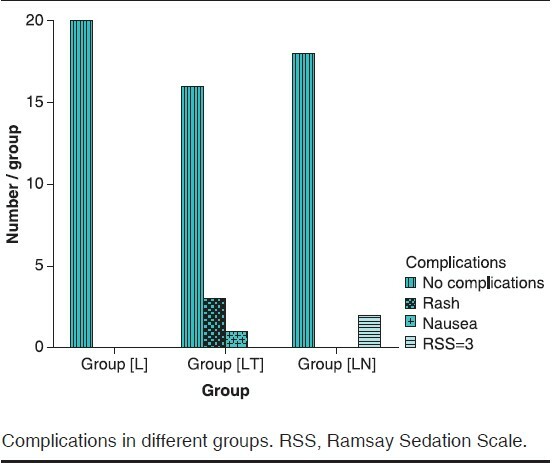 Moreover, pain-free duration was significantly longer in group M compared with group L. Throughout 24 h after surgery, 31 patients requested rescue analgesia only once, 37 patients requested it twice, 16 patients requested it three times, and only six patients required rescue analgesia for more than three times. Patients who received combined therapy requested rescue analgesia at significantly lower frequency compared with those who received local anesthetic alone. Patients enrolled in group M showed a significantly lower mean sedation score at 30 min; however, at 120 min postoperatively, the score was nonsignificantly lower in comparison with group L. Conclusion Pre-emptive epidural bolus of magnesium sulfate and levobupivacaine provides postoperative analgesia superior to epidural levobupivacaine alone for patients undergoing open abdominal hysterectomy. Background Postoperative pulmonary dysfunction is one of the common complications after cardiac surgery that may lead to serious morbidity and mortality. In this study, we investigated the potential benefit of continued lung ventilation while on cardiopulmonary bypass (CPB) to minimize postoperative lung injury whether resulting from CPB alone or from non-CPB causes. Patients and methods It is a prospective study including 60 patients who were randomized into two groups, each of 30 patients. One group underwent modified CPB (the MB group) where the lungs were ventilated with low tidal volume 3 ml/kg and PEEP of 5 cmH 2 O, whereas the other group underwent the conventional CPB (CB group) with total ventilation arrest and no PEEP. Parameters such as PaO 2 /FiO 2 ratio, alveolar arterial oxygen gradient [D (A-a) O 2 ], extravascular lung water, static and dynamic lung compliance, extubation time, and postoperative chest complications such as pleural effusion, atelectasis, and pulmonary edema were compared in the two groups. Results In the MB group, there were significantly higher post-bypass extravascular lung water, lower static and dynamic lung compliance, higher post-bypass PaO 2 /FiO 2 ratio, lower D (A-a) O 2 , and shorter extubation time. However, postoperative complications on first and fourth postoperative days were insignificant in both groups. Conclusion Lung ventilation with low tidal volume during CPB can reduce the potential of post-CPB lung injury by improving lung oxygenation, reducing lung ischemia, and decreasing postoperative lung atelectasis, resulting in shorter extubation time and less postoperative pulmonary complications. Background Anesthetic complications are among the most common adverse effects in congenital cardiac catheterization. Although the presence of an expert pediatric anesthetist will markedly reduce these complications, other factors may contribute toward their development. Objectives To determine the factors associated with the development of anesthetic complications in children undergoing congenital cardiac catheterization. Materials and Methods We carried out a prospective study of 71 patients who underwent cardiac catheterization over a period of 6 months and analyzed the intracatheterization and postcatheterization anesthetic complications. Results The most common anesthetic complication was delayed recovery (11.3%). Other less common adverse events included postoperative vomiting (2.8%), sinus tachycardia (2.8%), postoperative agitation (1.4%), intraoperative arousal (1.4%), and intraoperative apnea (1.4%). Patients who had no anesthetic adverse events were significantly older and had higher body weight compared with those who had one or more anesthetic problems. In addition, patients who had anesthetic adverse events had significantly longer procedure time compared with those who had no anesthetic complications. Conclusion Factors that can contribute toward anesthetic adverse events in children undergoing cardiac catheterization include a longer procedure time, longer duration of anesthesia, and younger age. Background A single-dose strategy for cardioplegia is desired in pediatric congenital cardiac surgery, especially in repair of complex congenital defects. 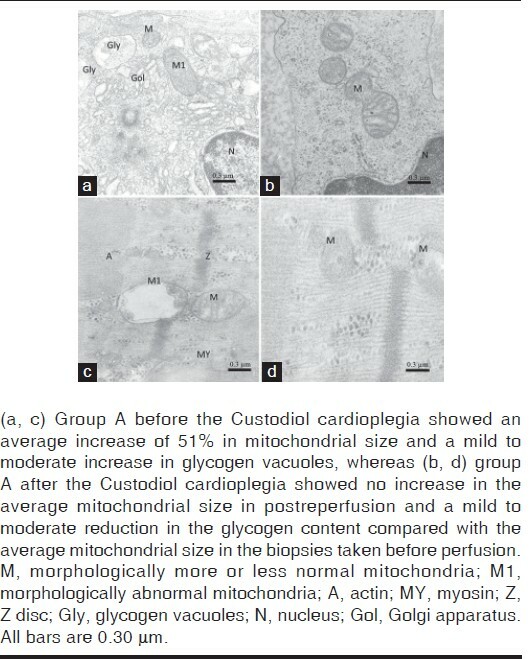 The hypothesis of this study is that a single infusion of Bretschneider HTK solution may offer myocardial and cerebral protection superior to repeated doses of a cold oxygenated blood cardioplegic solution in pediatric congenital cardiac surgery. Patients and methods Sixty patients who underwent congenital cardiac repair using cardiopulmonary bypass were grouped randomly to receive either a single dose of Custodiol (group A) or repeated oxygenated blood cardioplegia (group B). Echocardiography, ECG, and microscopic examination were used to evaluate left-ventricular function and structure. Myocardial injury was assessed with creatine kinase MB and serum troponin T, whereas cerebral outcome was assessed by jugular venous oxygen saturation. Patients were also neurologically examined and studied by brain computed tomography for gross neurological manifestation of cerebral ischemia or infarction preoperative and 2 days postoperatively. Results Myocardial enzymes and oxygen extraction were significantly high in group B compared with group A. Ultrastructure evaluation and cerebral outcome were significantly better in group A than in group B. Conclusion A single dose of an HTK cardioplegic solution provides better myocardial and cerebral protection than repeated doses of oxygenated blood cardioplegia during pediatric congenital cardiac surgery.